It Only Takes a Moment! A Dental Case on Which You Can Chime In! Our surgery anesthetist examines every mouth despite the reason for the anesthesia. 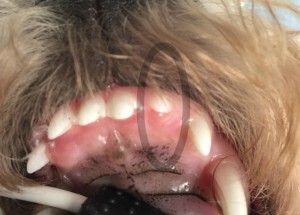 In this case, this young, 7 month old, medium sized dog was being neutered. She brought me over to the surgery table and asked, “Is this something we should be calling for permission for an intraoral radiograph”? Well, after some thought, it bothered me as to why all the other teeth erupted normally, yet this one did not. Furthermore, there was no crowding causing any interference. 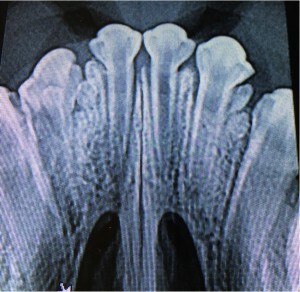 So, a call was made to the owner and we obtained permission for a single intraoral radiograph. So…would you have taken the time to get an X-ray of this? Do you see anything unusual? Respond the in the PetED Facebook comments as to what you think you see and what is the importance of it? Eventually, I will share the results and the importance with images. If you enjoyed this case, share it on your Facebook page so that your colleagues can have an opportunity at FREE education.